The Golden State’s beaches are famous for their variety, and tourists are often surprised at how different the beaches in the north are from those in the south. Where southern beaches are hot, sandy and tropical, northern California beaches are windy, rocky and rugged. It’s always a good idea to bring a jacket along when you visit the central and northern coast beaches. The water temperature – even in the south and even in the summer – is quite chilly by most people’s standards (seldom topping 75 degrees), and the northern waters are dangerously cold, decidedly choppy and rip tide heavy. What the two areas’ beaches have in common, however, is offering unparalleled natural, scenic beauty. Likewise, your California surfing experience will differ greatly depending upon whether you are on the state’s southern, central or northern coast. One surfing website’s descriptions of those experiences range respectively from “a surfer’s dream come true” to “wilderness surfing [on] isolated beaches” to “braving frigid water and sharks.” If you’ve never surfed before, you’ll definitely want to take some lessons before you set out on your own. Most of the state’s beach camp sites are open year-round and are in high demand during peak season (mid-March through October 1st). Obviously, you are more likely to be able to reserve a beach campground during the non-summer months, and reservations are accepted up to 56 days in advance of arrival. To make reservations call 1-800-444-7275 or 619-452-8787 (8am to 5pm, Pacific Time), and be advised that the California Parks and Recreation Department’s reservation system receives more than 3,000 calls per hour on some days. There is a fee to make a reservation. Campsites in county and national forests and parks are typically on a first-come, first-served basis, and during peak season they will typically all be taken by Thursday for weekend camping. Here is a list of California Beaches and nearby cities for your further information. 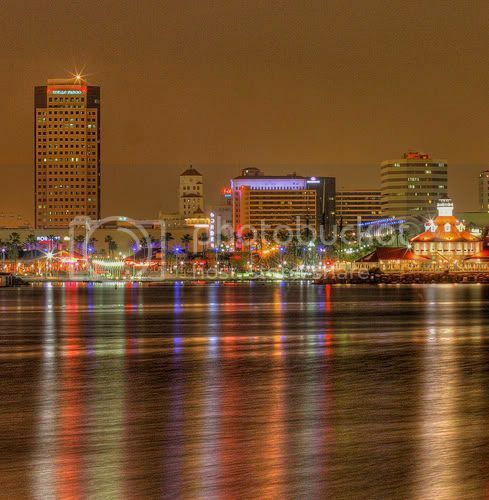 Photo of Long Beach at Night by kevindooley via flickr (Creative Commons).